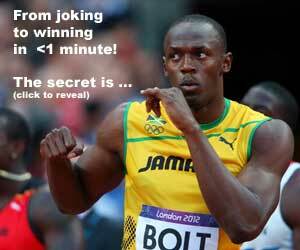 How do you predict a 4×100 meter Relay time? My calculations uses the best 4 times of each athlete from their season best (not personal best), subtract 1 second due to acceleration out of the blocks for the 2nd, 3rd, 4th leg, and add 0.1 sec for each of the 3 exchanges. That’s the lead-off leg, 3 x 100m fly times, and 3 perfect exchanges. So add the 4 open SB 100 meter times and subtract 2.7 seconds. All this assumes one thing: perfect passes and the baton makes it all around the track! Don’t forget that for each exchange you can gain up to 5 feet (or 2 arms length) in “free distance” with your outstretched arms. I’ll use the example of GDR’s 41.37 set in 1985 WC in Canberra. Drugs or no drugs, it’s the time I am calculating. Both of these are fairly close to the 41.37 WR. When you add up the season bests for Nesta Carter (9.90), Michael Frater (9.88), Yohan Blake (9.92) and Usain Bolt (9.88), you get 39.58 – 2.7 = 36.88. It’s clear that Jamaica can run 36-mid if they used the top 4 fastest men plus 3 clean crisp exchanges. Personally, I don’t care what relay passing technique you use, whether it’s the Push Pass or Upsweep pass. As long as both runners (incoming and outgoing) are near full speed, and you can maximize the free distance with outstretched arms, then either one will work. France is known for keeping the Upsweep pass, despite the rest of the world using the Push Pass. Coaches, take your best four 100 meter sprinters, and see how this formula works for you, assuming perfect exchanges. Theory is good, but you have to get the baton around the track! Yes Mr Lee i think too that Bolt is for 9.70 or less in 100 if he has positive wind. So my prediction would be around 9.80 in that final in Daegu(perhaps Blake wih Bolt in race improve since 9.92 to 9.88 there). So how bad must the Jamaican women change overs be then, if they have 3 10.7x runners (Fraser, Stewart, VCB) and a 10.8x runner (Simpson) but can’t get near the 41.37WR? Jamaican women should demolish the WR, just like GDR did back then. They’ll need to train as a team and execute perfect handoffs. Really this year Fraser and Stewart were only in sub11 shape, only Verenoica was in shape 10.7 and Simpson “only” 11.00, i dont think that with those times is easy get WR. Well, even that the shape described by Harry, they are still faster runner for runner than the GDR team. Have a look at the video of the race. All of the hand-offs occur right near the start of the changeover zone, not at the end where it is meant to be for maximum speed. Every leg the Jamaican runners take ground off the USA counterpart, only to blow it all in the change-overs. You would think that with all the effort that professional athletes put into winning an individual gold medal that it wouldn’t be too much for them to put a similar effort into getting their change-overs right for a relay. What a shame, as it would be such a good statement for women’s sprinting to break a record that was set in “that era”, and the sport can look forwards rather than backwards all the time. I’ve put some data about the relays in Berlin in my blog. 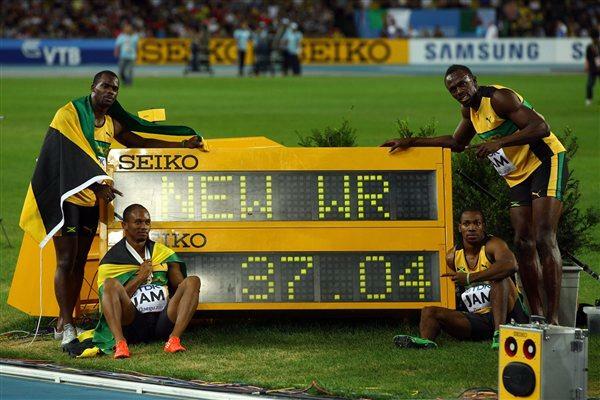 It can be seen the best relays of the history in some aspects and times of Bolt and Blake.